It’s interesting to know that banks are now beginning to utilize WhatsApp Instant Messaging for their banking services. Just few weeks ago, Firstbank, UBA and GTBank announced the introduction of WhatsApp banking which will take effects from September 1 2018. 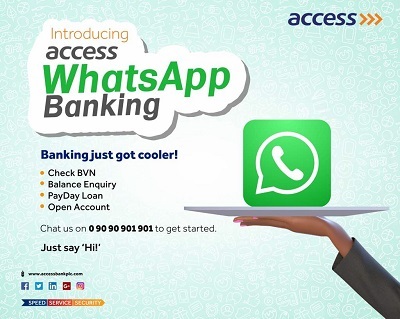 However, Access Bank WhatsApp banking is now live. So if you bank with Access this is good news to you. Customers will be able to perform basic banking services such as opening of account, check account balances on the go, request Payday Loan and BVN Display. >>Make sure you use the registered number with bank on WhatsApp. This is a good move by the bank adopting WhatsApp services, meaning sooner or later, WhatsApp pay will be supported. I still prefer using either USSD or app to this WhatsApp banking. Nice one, prof how do I join the gtb own. Let’s how this goes in terms of how safe it is. I bank with access but am not ready to try it yet.